PITTSBURGH, PA – AMETEK Process Instruments has broadened its AMEVision communication and display system capabilities to include the 3050 series of moisture analyzers. Originally designed for WDG-V analyzers, the AMEVision system provides real-time moisture measurements and trend data while also detailing a variety of maintenance and troubleshooting information. Users can now continually monitor the measurement and diagnostic information for up to eight 3050 series moisture analyzers. AMEVision enables the convenience of on-site calibration and communication with analyzers via Modbus RS485 and Ethernet LAN. The system augments or replaces the 3050 configurator software, providing all the same features and capabilities, including span verification and zero calibration. Additionally, AMEVision stores the last 10 successful calibrations and all alarms. 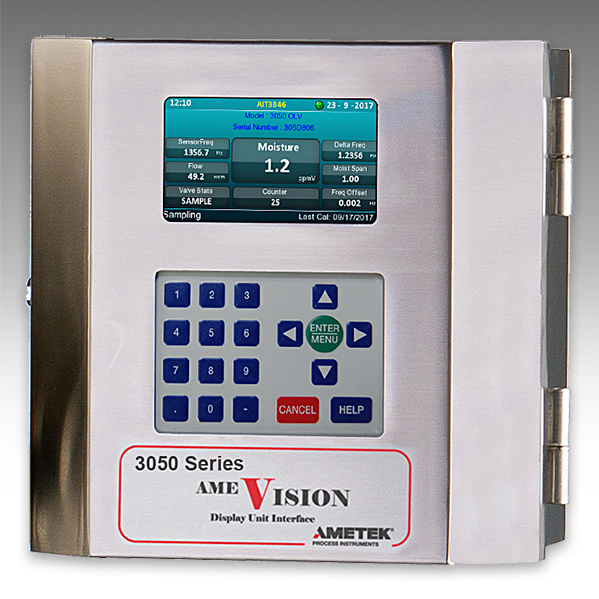 The 3050 series analyzer can be pre-configured at the factory to directly communicate with AMEVision, eliminating the need to set it up, which will ultimately save time in the field. Users can extract data and upload new configuration files directly to the unit via a USB port. AMETEK Process Instruments is the leader in online analytical instrumentation with the industry’s most extensive product line. The company offers analyzers based upon 11 differentiated technology platforms for use in a variety of markets including oil & gas, power, pharmaceutical manufacturing and semiconductor chip manufacturing.